Did you know that there are things you can do to help your baby cry and fuss less in the first 16 weeks? Did you know that many parents’ nights are unnecessarily disrupted? 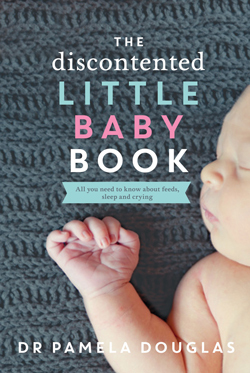 Dr Pamela Douglas’s new book, The Discontented Little Baby Book, is purchaseable in bookshops and online at UQP and Amazon, including as an ebook. The Discontented Little Baby Book doesn’t promise magical cures. The months after a baby’s arrival can be tumultuous and exhausting, and attempts at quick fixes are often part of the problem! The first 16 weeks of life is a neurologically sensitive period, during which some babies will cry a lot - and we can also expect broken nights. But there is usually a lot that can be done to help your baby cry and fret less, and a number of obstacles are accidentally put in the way of a healthy night’s sleep for many babies and their parents. The Discontented Little Baby Book gives you a range of practical and evidence-based strategies for helping you and your baby get more in sync. Pamela offers a path that protects your baby’s neurodevelopment so that he or she can reach his or her full potential, at the same time as you practice simple strategies for living with vitality and with delight in your baby, right in the midst of the challenges of this extraordinary time of life! Becoming a mother is one of the greatest transitions of a woman’s life. For many women it is a joyous adventure, but one that involves physical and emotional challenges and enormous personal adjustment. How are you going to rise to the challenge that motherhood brings? How are you going to enjoy your life while trying to conceive, throughout pregnancy and as a new mum? How are you going to become a good mum—and just what is a good mum anyway? What kind of mother do you want to be? 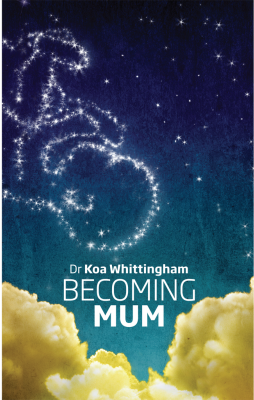 In Becoming Mum, Dr Koa Whittingham, a clinical and developmental psychologist, parenting researcher and mother, draws on the latest research, her clinical experience and her own experiences as a mother. In each chapter you will find suggestions on how to apply the concepts presented in Becoming Mum to your unique situation, including coping with challenges such as miscarriage, postnatal depression and preterm birth. Becoming Mum is written for all mothers, regardless of the specific challenges that you are facing, to support your unique journey from first trying to conceive, throughout pregnancy and into your new life as a mother. Become the mum that you want to be!